The University of Washington’s Institute for Health Metrics and Evaluation (IHME) has been refunded by the Bill and Melinda Gates Foundation – $279 over 10 years. The IHME has been assessing the country, regional and global burden of multiple diseases, its impact on health status, mortality and indirectly on economies with years of life lost, and trends over time. It has published a series of remarkable papers, many in the Lancet, which have influenced health policy. In 2012, the number and impact of fungal skin diseases worldwide was estimated at 985,457,000 (14.3% of the population) and the impact (years lived with disability) had increased from 1,618,000 to 2,303,000 between 1990 and 2010 (1). In a follow up paper all causes of death were estimated (2). Numerous methodologies were applied and overlaps of underlying diseases (such as opportunistic infections) not counted. The lack of birth and death registration, including causes of death hampers efforts to collect accurate data. 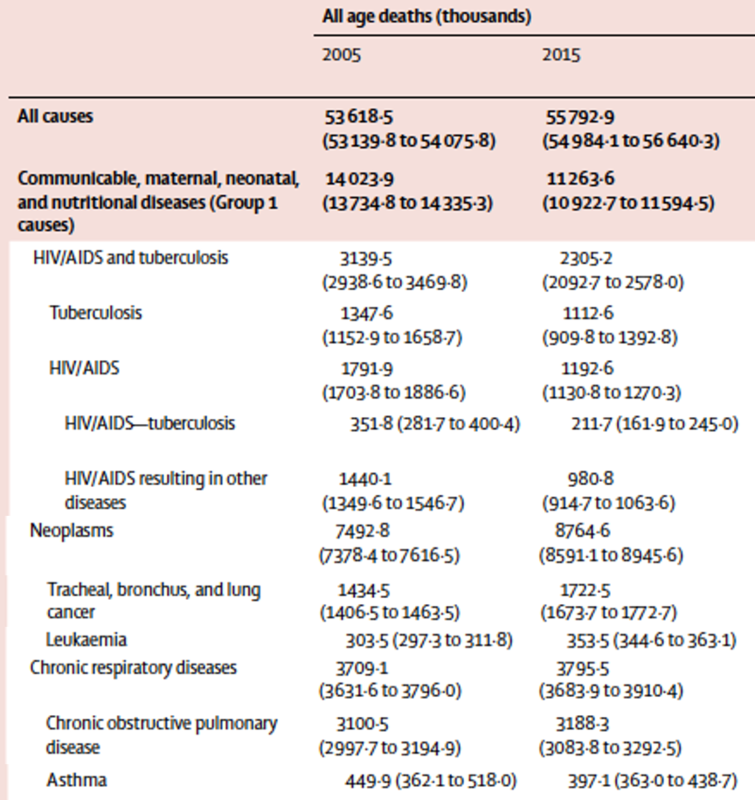 Causes of death compared between 2005 and 2015, with selected underlying diseases more commonly associated with fungal diseases. GAFFI’s separate estimates of deaths due to fungal diseases are shown in the 95-95 by 2025 Roadmap and appendix 3. (1) Vos T, Flaxman AD, Naghavi M, et al. Years lived with disability (YLDs) for 1160 sequelae of 289 diseases and injuries 1990-2010: a systematic analysis for the Global Burden of Disease Study 2010. Lancet. 2012;380:2163-96. (2) GBD 2015 Mortality and Causes of Death Collaborators.. Global, regional, and national life expectancy, all-cause mortality, and cause-specific mortality for 249 causes of death, 1980-2015: a systematic analysis for the Global Burden of Disease Study 2015. Lancet. 2016;388:1459-1544.